Mondeuse has its roots in the Savoie, the region of France bordering Switzerland. Mondeuse from the Savoie is a juicy red wine with deep color and peppery flavor. These characteristics make this grape a good choice for Rosé production. 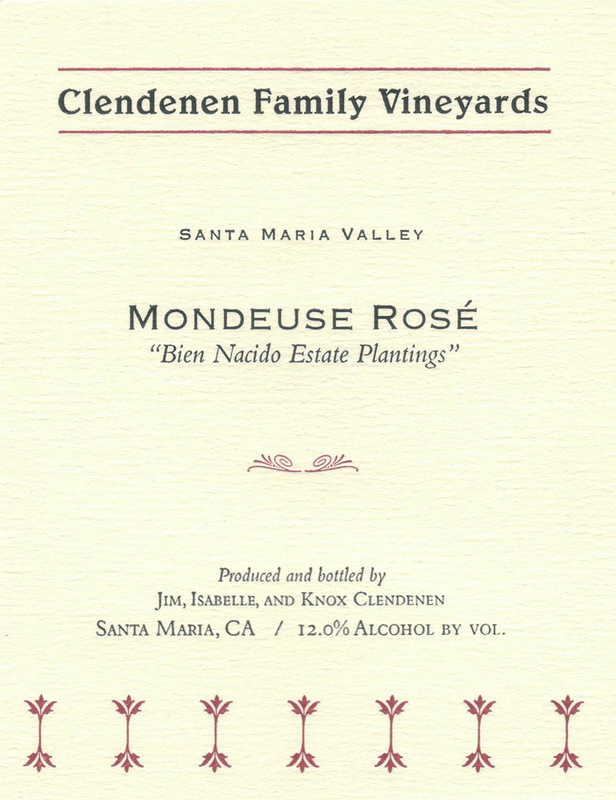 The Mondeuse is grown at Bien Nacido Vineyard in the Santa Maria Valley. Mon-deuse ripens late in this cooler growing region. All the grapes are destemmed and the juice for Rosé is separated immediately after destemming to keep color and tannin extraction to a minimum. The Rose juice is settled over night to keep the fermentation clean (to avoid any leesy flavors in the Rosé). The juice goes through primary and malo-lactic fermentation in clean neutral barrels. After a short 4 month barrel aging the wine is bottled.